Whenever I asked the question, I always got the same answer: Chicago. 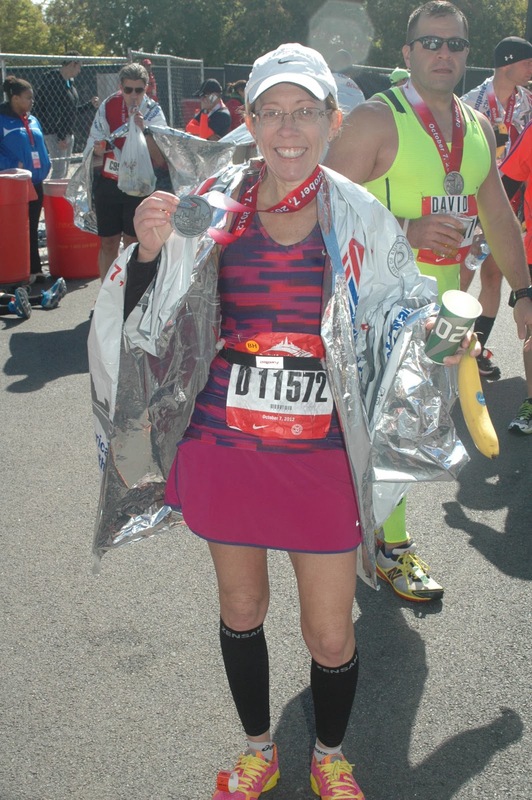 At my four previous World Marathon Majors: New York City, Boston, Berlin, and London, I met many runners who were repeat offenders, or people who kept running marathons. Some stopped at 10 marathons, others wanted to run all 50 states, and I even met runners reaching for 100 marathons. Then at the Berlin Marathon there was Henry, who had run 751 marathons (but who’s counting?). And all of these runners, when I asked them which one was the favorite, every single person quietly answered, “Chicago”. And then they smiled, and had a faraway look in their eyes. I could not wait for this Holy Grail of marathons! But to be honest, I was a bit uneasy. 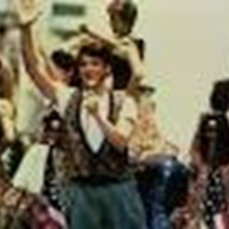 What was it about Chicago that was so great? 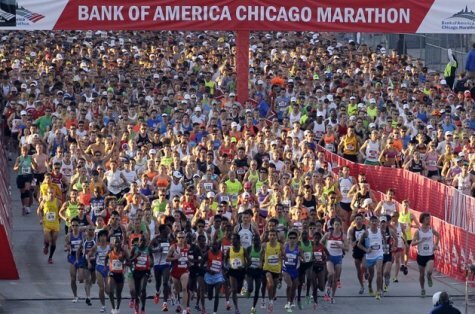 One day would I be one of those marathoners who would speak about Chicago in such hushed tones? The first way to judge a marathon was by its expo, held at least one day before where the runners pick up their racing gear (number and chip) and buy running related merchandise, and hope to see some running stars. My uber running friend Sue (who would qualify for Boston again for the third time a few days later) and I loved this expo so much we went both Friday and Saturday to shop, and get our picture taken with two people who were in the movie “Spirit of the Marathon”, about the 2005 Chicago Marathon: Deena Kastor (who holds the American women’s record in the marathon and is one of only 2 women to medal in the marathon at the Olympics) and Jerry, a regular guy running the Chicago Marathon in 2005 with his daughter. Deena was happy to talk with me about our shared birthday (February 14th, a double celebration every year) and wished us good luck at the marathon. Jerry was a good sport about getting a picture taken with me, after I told him I loved seeing him in “Spirit of the Marathon”. A cool thing about running one of the 5 Majors is that they are all in big cities where there is lots to do and see. Chicago didn’t disappoint. Sue and I visited the Field Museum for several hours, enjoying every minute of this natural history museum’s amazing collections. Sue, of course, posed with her namesake, “Sue” the Tyrannosaurus Rex. and also with a friend from as far back as early 1963, Michele, with her husband Joel. Michele was my next door neighbor in New Jersey, best friend from age 4 years old, with whom I shared many adventures and conversations, especially with paper cups attached by string from my house to her house. That night after dinner I said goodbye to my friends went back to my hotel room and begin my pre marathon rituals, which include setting out all my clothes the night before on the bed, both for running and the outer clothing I would wear at the start. The morning of the marathon brought almost perfect weather to run 26.2 miles, beginning with 41 degree temperatures. Sue and I left the hotel and walked over to our corrals. Who do we run into, among the other 40,000 runners, but Ilse, Leslie, and Cindy G. from our running camp. And that’s when the magic of Chicago started. The other 4 world marathon majors involved lengthy bus rides to the start, and then time spent hanging outside in the cold weather for up to 4 hours before the start. Not Chicago. We left our hotel at 6:35, and by 7:30 AM we were running. And I mean running fast, from the second our feet hit the start mat (while Bruce Springsteen’s anthem “Born to Run” blared out of the loudspeakers). The running field was never crowded. Not once did I have to slow my pace because I was surrounded by slower runners. The Chicago organizers had not only 2 start waves but corrals for the runners depending upon previous running times. We ran through 29 diverse neighborhoods. My favorite was Chinatown. As we approached this neighborhood, first we were greeted by dozens of Japanese flags, then Japanese families cheering for us next to about 20 drums being played by men dressed in traditional Japanese attire. That was our introduction to the streets of Chinatown, where hundreds of people stood outside Chinese restaurants and shops, people of all ethnicities, yelling and cheering for us marathoners. Only in America, I thought, could so many people all come so peacefully, so happily, for such an event. On my way to the finish line, I saw some other signs. At mile 3.2, I saw some people with a University of Dayton sign. “I’m a Flyer!” I yelled out, as they waved to me. 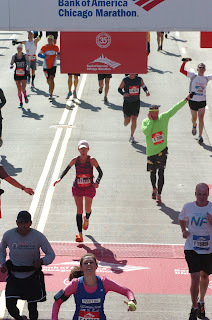 Around mile 10, I saw a New Jersey Runners sign. “Jersey Girl!” I called to them, and they yelled back something in Jersey-ese. Somewhere in the high teens, I saw a sign that said “University of Florida”. “Gators!” was all I could say at that point, which was meet with the Gator chomp sign by the UF fans. 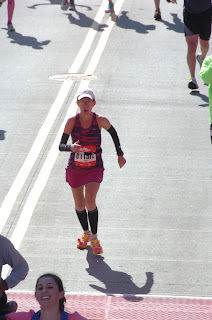 And later, somewhere in the 20 mile range, I saw signs that said “Go Mom!” and “Keep running, Cindy!” I couldn’t get any words out at that time but pretended those signs were for me and smiled. Others finished before me. The male champion, Ethiopian Tsegaye Kebede, set a course record of 2:04:38. 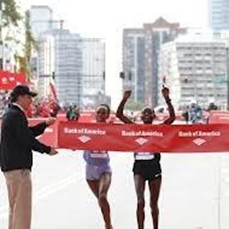 Another Ethiopian, Atsede Baysa, won the woman’s race by one second, the closest women’s Chicago Marathon finish in 2:22:03. How incredibly cool for amateur runners like me to be running the same race on the same day as these speedy professionals. 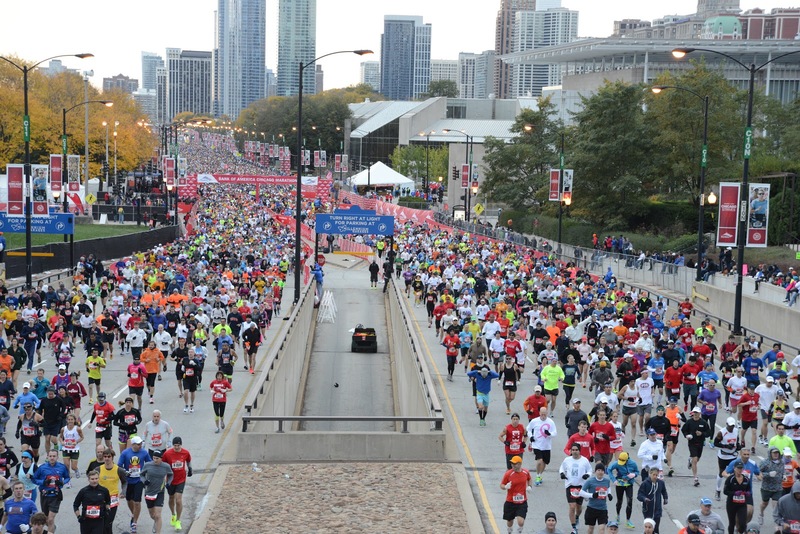 A record number of finishers, 37,455 runners, crossed the finish line in Chicago's Grant Park on October 7, 2012. I was one of them. But there was no way I could have run such a great race, no way I could have even finished, without the help of my team of experts. Coach Doug Butler's advice and running camp program once again made running so much fun for me and got me to run stronger and even faster than I needed to go. 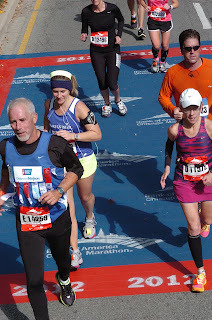 When faced with typical runner's injuries such as plantar fasciitis (mid July) and a sprained ankle (mid September), and a not so typical runner's injury (a broken wrist in mid August - a waiter in Rhode Island, after hearing I broke my wrist while running, asked me, "Do you run on your hands? "), Doctors Larry Bishop, Bruce Thomas, Mike Shapiro, Kurt Hensel, and Briant Moyles, and Physical Therapist Jeremy Stewart, not only fixed what was broken but made me feel better and healthier than I have ever felt. 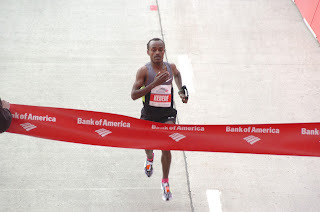 A friend asked me when I knew I had a chance at qualifying for Boston again. Was it in the last mile? Halfway through the race? 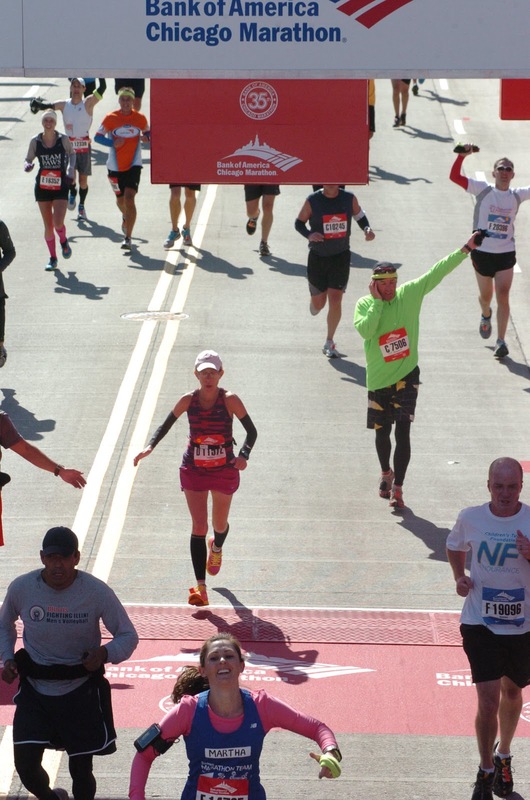 With the help of these seven men on my running team, I knew I had a shot at Boston from the first step I took on the start mat.